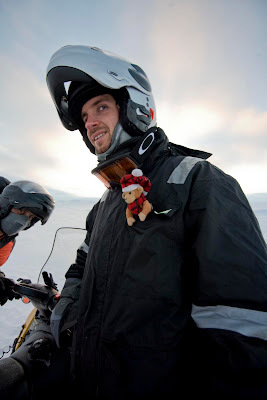 Antarctic Monkey: 4-nights, 3-men, 1-tent...a sitcom in the making? 4-nights, 3-men, 1-tent...a sitcom in the making? 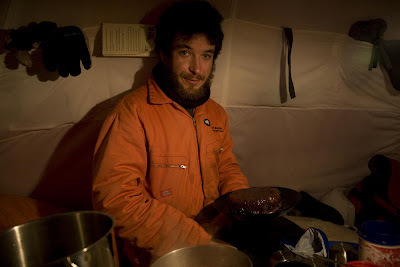 I don't know what our fellow winterers must have thought occured during the few days myself, Rich and Joe were living in close proximity to one another in a small tent in the middle of nowhere in the middle of Antarctica. But, upon our return, the outburst by myself when walking into the dining room for lunch that "I feel like a new man", and the appearance of a blemish on Joe's neck which suspiciously looked like a lovebite, certainly fuelled people's imaginations. 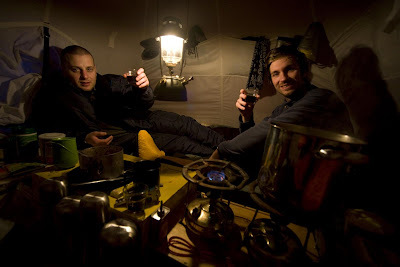 Yes, indeed there were three men spending the majority of their time stuck in a tent due to bad weather. The risk of boredom being very real in such situations may lead people to think that we may have "entertained" ourselves (for "entertained", read "big gay three-man gangbang") but this was certainly not the case. When walking into the dining room I was in fact referring to the euphoric feeling following a nice hot shower after spending 4 nights without such facilities, and Joe's unfortunate lovebite was the result of mild frostnip from the skidoo journey home. Rich and I, Gimps Inc. The atmospheric chemistry group at BAS participated in the week long Cambridge wide science festival organised by the Cambridge University departments. The BAS exhibition included a pyramid tent, various Antarctic clothing for people to try out, a reconstruction of one of the 10 low-level ozone monitoring sites deployed from Halley by Andy Rankin during the summer, various BAS scientists and an exhibit where people can talk (through the power of modern technology) live face-to-face with a real Antarctic scientist...me. I was linked via webcam and VOIP to a computer terminal in the exhibition room, and the display was projected onto a screen. The idea was for people to just come up and have a chat to me about life and science here at Halley. 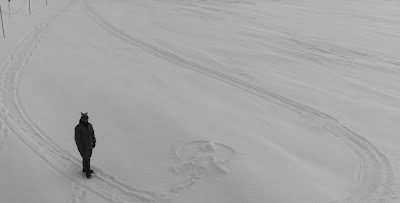 I was on a wireless link with the laptop, so I was free to walk around the Simpson building showing different bits of science and give live views of activities going on outside, such as base commander Ags making snow angels in the soft snow we had the night previously. The exhibition lasted all day, and the main purpose was as an educational tool for the various children walking around. They were each given a question sheet to answer by finding out the information by asking me. Although I had received a copy of the types of questions that would be given out, I hadn't done my research. I was soon finding myself being asked questions to which I could not answer, such as "how big is the ozone hole over Antarctica?" (particularly embarrassing as I am the guy who does all the ozone hole monitoring here), or "how old is the oldest ice-core"? I had an amazingly fun day, and I like to hope I have provided inspiration for all those scores of children I spoke to. They did all seem generally interested in what I had to say, some even lucky enough to witness a snow angel being made live 14,000miles away. The following day I was off on me holidays. 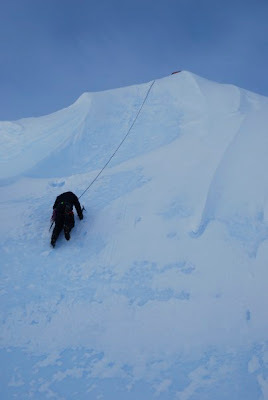 5-days camping Antarctic style in the Hinge Zone with the aim of exploring ice-caves, climbing ice-cliffs and abseilling into crevasses. 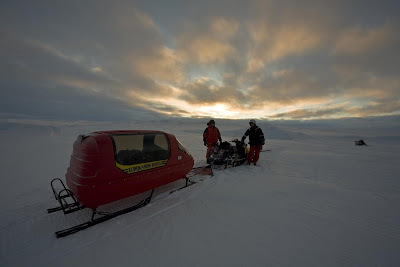 Myself, Joe (who's original trip got cancelled in the summer due to a 4-day blow) and GA Rich all packed up, kitted up and headed off on skidoos towing sledges to the Hinge Zone. Each skidoo/sledge combo had to be linked to the skidoo/sledge combo in front in case any one of us happens to fall into a crevasse. So we made a nice long train approx 150m long. Each person was also clipped into the system via a harness so that if a skidoo did drop into a crevasse, the rider would not fall to his doom by falling off the skidoo itself. As explained before somewhere in this blog (I think), the Hinge Zone is where the Brunt Ice Shelf is fed from the Antarctic headland. Therefore, it is adorned with natural features where the ice shelf buckles and bends as it flows over the rocks below. 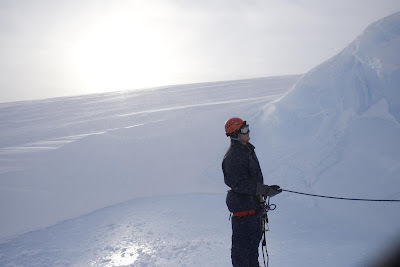 This creates lots of brilliant features for us to climb around, and plenty of hidden crevasses to avoid also. And so we headed off on our skidoos. 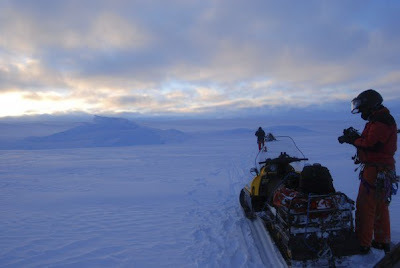 The temperatures were about -20C, and so it was wise to wrap up properly if riding on a skidoo. This meant donning the special gortex face masks we get issued with. They keep the windchill of your face...and they also make you look like a gimp. Again, another unhealthy image to associate with three men about to head off to go camping together! 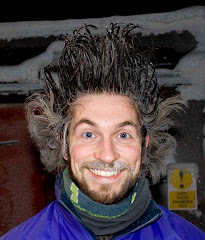 When you have a beard and you breath in -20C, your breath condenses onto your beard and freezes instantly. Rich breathed a lot during the 2 hour journey to the Hinge Zone. Thus, he had a lot of ice on his beard as a result. A lot of ice which was sticking his gimp mask onto his beard. The facemask Rich wears just happens to look like a cricket batsman's box! When he finally ripped off his mask, it was probably the most disgusting thing I have ever seen. For in this instance, it looked like a cricket box with a good set of curly pubic hair stuck around the rim! Have you ever laughed and gagged at the same time?! We set up camp, pitching up the 3-man pyramid tent, the HF radio, setting out the inside and outside supplies. And finally, most important...pitched the poo tent. It is a converted pup tent with the floor cut out. 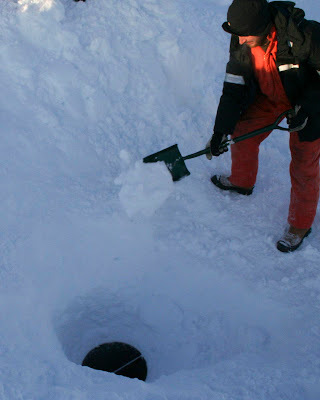 A hole is dug in the snow, with a ledge in the middle and a deeper hole on the other side for the crap and the tent is pitched over it. A wooden seat with a hole is the added for the finishing touches. 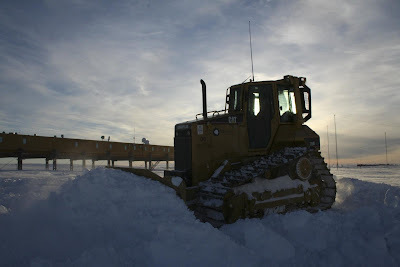 And presto, a toilet in the field in Antarctica, complete with shelter and a seat. It is luxury compared to the alternative. Mind you, the deep hole end was facing the wind and so a nice breeze would get in under the canvass to blow down between your cheecks when using the toilet tent, so one had to be quick when doing ones business. And it was imperative to restrict ones trips to as few as possible, i.e. building up the bowel pressure somewhat during the day and releasing it in one go! Unfortunately the weather wasn't the best it could have been. It was cloudy the majority of the time and the wind picked up now and again. 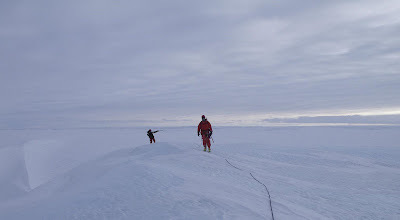 These conditions affect visibility and contrast and so it would be silly to go out in crevasse fields in conditions like that. 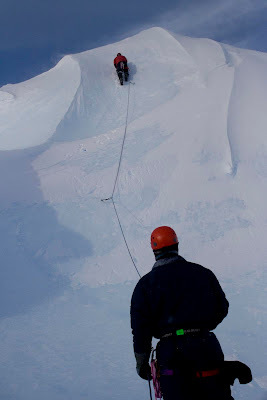 We did get a good couple of 1/2 days out though, and got in a few trips climbing and skidooing around the large chasms. We had one complete lay-up day in the tent, but it wasn't too bad. I was totally chilled out, reading a book, in a nice warm tent, with the wind whistling outside buffeting the tent, the primus stove soporiffically lulling me to sleep. I was so relaxed. And then it would be ruined by the need to nip outside to the pee flag of the poo tent. The pyramid tents are quite efficient. 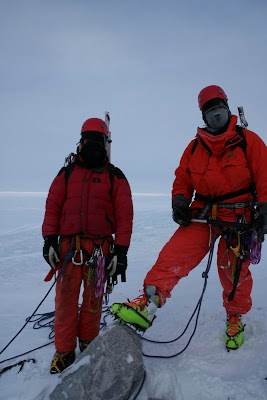 Although it would be -20C outside, in the morning the temperature inside the tent would be a mere -9C!!! 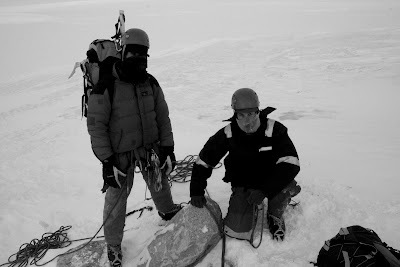 It quite an experience to wake up in the morning with ice all over your sleeping bag where you've been breathing. Conversation was never lacking in the tent, with Joe routinely reminding Rich and I how "regular" he was prior to visiting the other tent, and coming out with classic quotes such as "ooh, I need a p*** do you need a hand Rich" or "I really could do with a McDonalds". The other good day we had out, we walked to what is known as Stony Berg. I had no idea why it was called Stony Berg, but it all came apparent later on. It's got stones in it! 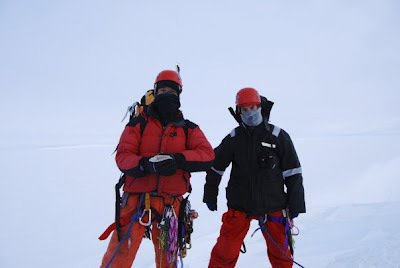 Myself (left) and Joe (right) walking along the cornice of a cliff. I almost slipped down the slope, which would have dragged the others with me as we were linked! Stony Berg is unique. The Brunt Ice Shelf is exactly what it is...a shelf of ice. But, within all of this ice there happens to be just this one special feature. The aeon slow churning of the ice as it slides off the Antarctic mainland has obviously caused some rocks to be dragged with it. And years and years later, the rocks have been spat out on top. After being here for 4 months and seeing nothing but snow and ice, it was quite surreal to actually see some real rocks. I was quite outstanded. And to think that for millions of years these rocks have been covered by thick ice until they were disturbed by the flow of the ice, eventually rising to the top of the very ice that had incarcerated them all that time. And here they were, silently sitting on top, the only visible rocks for miles and miles to be seen, waiting for residents of Halley station to stumble upon them several years ago. On the Thursday it was time to pack up camp and head home. We had heard on the radio sched the night before that the weather was going to turn nasty. We returned home on Thurday with a westerley wind coming from our left. And that is how Joe got the lovebite on the left of his neck. All in all, it was a fantastic week. 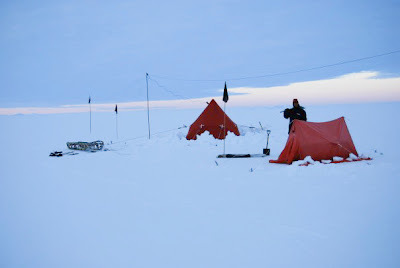 It was fun to get out and about away from base, and live life in a tent in Antarctica. Not many people will ever get to do that in their lifetimes. People would in fact probably pay tens of thousands of pounds for a holiday like that. Me...I get paid to have a holiday like that. I am also proud to say that I survived eating out of the manfood box a packet of freeze dried macaroni cheese which was dated mid-1995! Back home and straight into some proper self-made winter entertainment. -19C has become quite a balmy temperature for us of late. Whenever the communal weather display in the dining room shows anything above -20C we see it as being quite a warm day. It just so happens that it turned out to be a warm evening for the planned BBQ on this particular Friday. Paddy excelled himself by proving a brilliant meat-tastic spread of BBQ steak, sausages and burgers, jacket potatoes and salad (of the salad we had remaining from the shipment in January)! It was all finished off with some lovely freshly made toffee apples for pudding. The BBQ was splendid, and although I got some photos, none of them does it any justice and so I am not going to even bother put any on this blog. The same evening was a chance to take a group photo of the wintering team. Not in any way our official winter photo mind, but rather one to send to our neighbours...the Germans at Neumayer (800km or so away) who had kindly emailed us wishing us a successful winter, complete with attached picture of their team. I see that they have a metbabe also...a proper female one at that too! And then we went indoors into the warm to continue the evening's entertainment, which absurdly ended up being a gaming-fest of mastermind, pool, darts and battleships. Oh how we live it up here on a Friday evening. Oh yes...this was it. A chance to fulfill one of my life long dreams and have a totally 80's themed evening, complete with dressing up! Ags turned the lounge into an 80's themed restaurant (deliciously named "Simply Irresistable") and I was to be her waiter. A waiter is in no way like a butler, so I was excused to be a bit slack in my approach to serving the tables. The restaurant came complete with video screen displaying 80's pop videos, and plenty of 80's style posters. 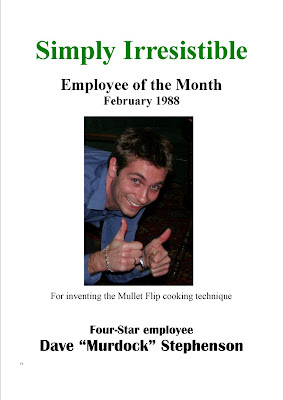 There was even on the wall an "employee of the month" award. Coincidently, I happened to be the employee of the year, (probably something to do with the fact that I made the award myself). Everyone made an effort and dressed up. I took hardly any pictures all evening so I cannot show you the wonderful costumes we had. 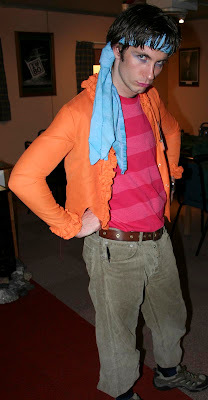 I came as a New Romantic, we also had a punk rock chick, John McEnroe, The Karate Kid, some eccentric entrepreneur (or it could have been Scott just being his usual self), what I can best describe as an 80s rock singer, and an 80s disco king. After dinner, we partied the night away to 80s classic after 80s classic. And you've got to admit, there were plenty of classics from that decade, huh??? 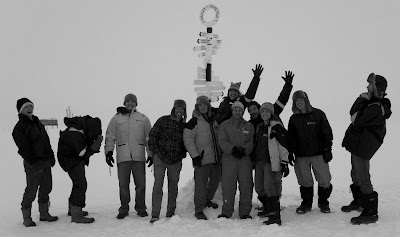 And thus proves that, with a lot of hard work and team spirit, Halley station can be run with a skeleton crew of just 11 people. That is, of course, until I have to step into the role as Sunday cook! As was the case on Sunday 30th March. Even the chef needs 2 days off during his week, and so we all take it in turns to cover those days and cook for the rest of the base. And it was soon my turn. Little did they know what they had let themselves in for! But, it turned out alright in the end, and everyone survived my lamb hotpot. The only thing that didn't survive was my ill-fated attempt to make honey pudding. Well, it was edible. It just didn't turn out to be how Linda McCartney told me it should look. The following week I was on melt-tank duty with Bryan and Hannah. Melt-tank duty is another responsibility shared amongst us. Our water supply comes from the snow that surrounds us. 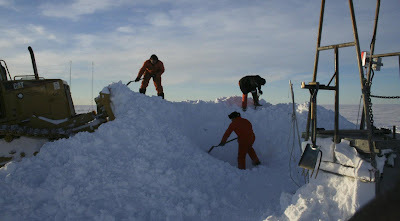 In order to get it from the snow surface into our pipes we have to dig it and chuck it down a chute. The chute feeds the Laws melt-tank which is now under 18 years of accumulated snow (some 30m below the surface). The melt-tank melts it, and the melt water is pumped up into a day tank on the Laws platform where it is filtered and treated with UV light en-route. Digging for the melt-tank each takes a team of 3 people 30 mins to fill to the appropriate level. And this has got to be done in all weather. Luckily, this last particular week I was on MT duty was good for weather. The time previously was during a good blow. And that concludes the activites during the remainder of March. 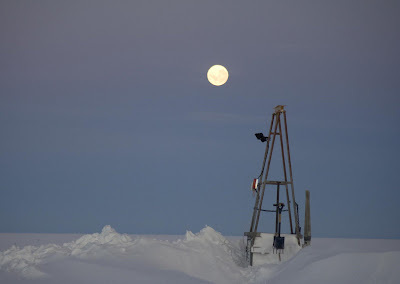 What wonders willl April bring the team at Halley? Only time will tell. But a heads up from the chief scientist at Halley (the only scientist), yours truly: April 30th brings sundown, the final sunset at Halley for 3 months. The dreaded 24 hour darkness is nigh. 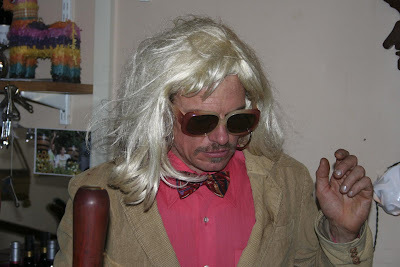 David, damn wonderful blog, as per usual, and funny also. Linda McCartney told you how to cook honey pudding? When did this miracle happen? For the record, it was not me who left the remark, "where is everybody", on your last blog, but no apologies are needed for the accusation!!! To your usual high standard Mr S.
At least you now know your true level ie waitering rather than butlering. I enjoyed your brilliant blog as ever Dave, can't wait until the next instalment. I'm sure the timing of the "where is everybody" comment gives the identity away, a person who perhaps lives in a zone an hour behind GMT? i'm surprised dave the fave didn't get mumsy wumsy to send him a food parcel especially cos he can't cook, wont eat! ah, i see that no-good busboy steve is still bitter and twisted that you stole his crown! Nice eyeshadow :-) I can see now why you were growing your hair - just to perfect that New Romantic look. P.S. How many hairs were lost in the melt tank this time?